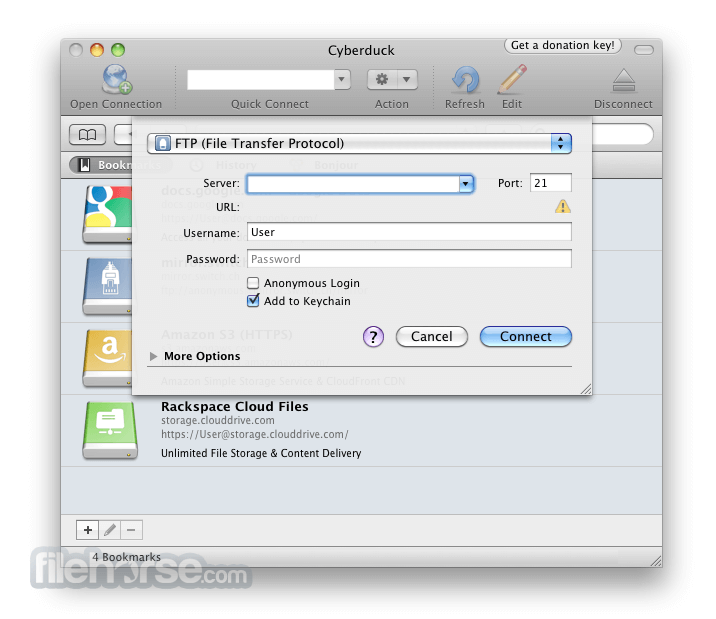 Cyberduck for Mac is an open source FTP, SFTP, WebDAV, Cloud Files and Amazon S3 browser for the Mac. 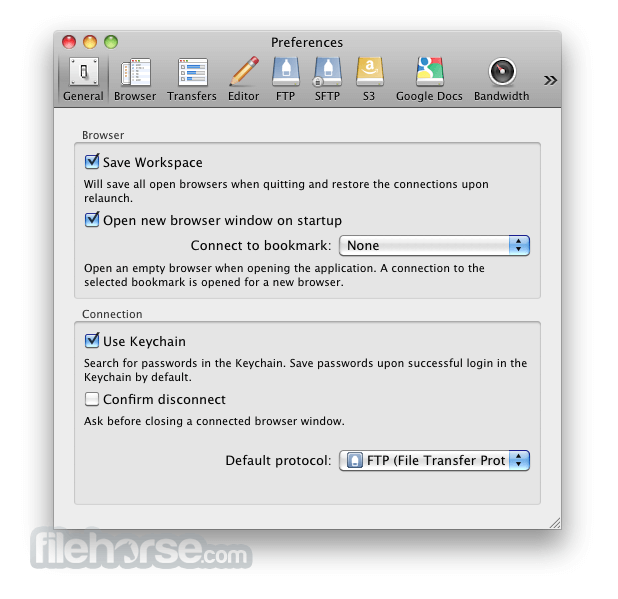 It features an easy to use interface with quickly accessible bookmarks. The outline view of the browser allows to browse large folder structures efficiently and you can quickly preview files with Quick Look. To edit files, a seamless integration with several external editors makes it easy to change content quickly. Both Amazon CloudFront and Cloud Files from Rackspace can be easily configured to distribute your content in the cloud. Many OS X core system technologies such as Spotlight, Bonjour and the Keychain are supported and a large number of translations makes you feel at home. 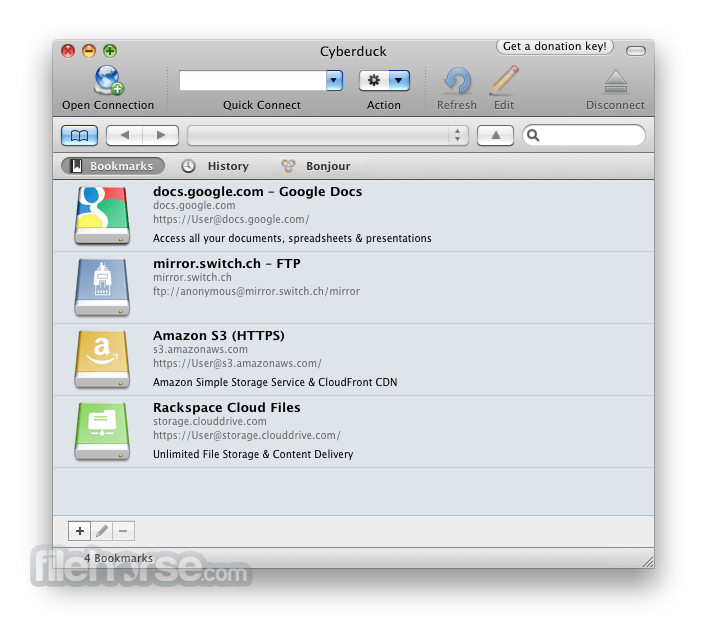 With an easy to use interface, connect to FTP (File Transfer Protocol), SFTP (SSH Secure File Transfer), WebDAV (Web-based Distributed Authoring and Versioning), Amazon S3, Google Cloud Storage, Windows Azure, Rackspace Cloud Files and even Google Docs. 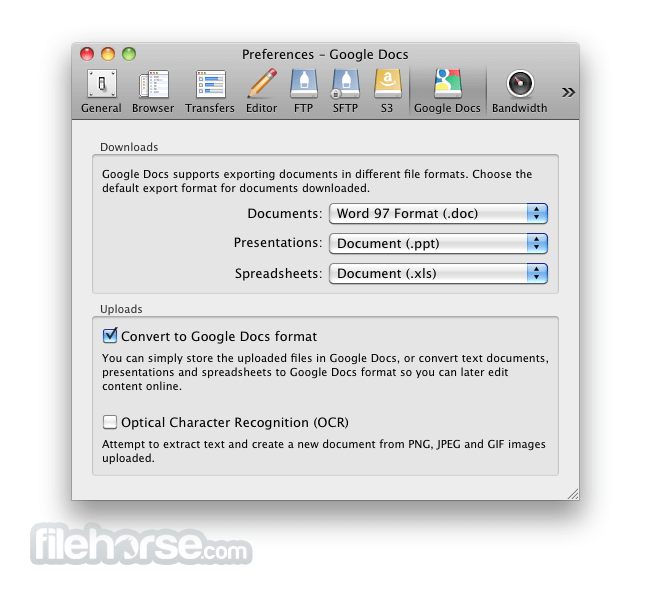 Convert uploads to Google Docs format and Optical Character Recognition (OCR) for image uploads. Define access control lists to share documents with other users using Google login credentials. And many more (First class bookmarking, Browse with ease, Transfer anything, Advanced SSH features, Integration with system technologies).